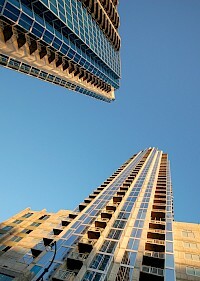 ViewPoint is a 480ft (146m) tall skyscraper in Atlanta, Georgia. It started construction in 2006 and has 36 floors. Preston Partnership, LLC designed the building, and Novare Group developed it. The first 2 floors have 50,000 square feet (4,600 m) of retail, and the skyscraper has 385 residential units. It is the 18th tallest building in Atlanta. 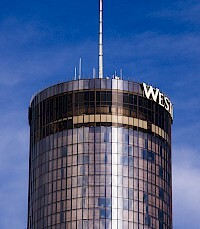 The Westin Peachtree Plaza Hotel is a skyscraper and hotel in downtown Atlanta, Georgia, on Peachtree Street adjacent to the Peachtree Center complex and the former Davison's/Macy's flagship store. It is 220 meters (723 feet) tall, and rises 73 stories from ground level. Its diameter is 188 ft (57 m). It is the second-tallest all-hotel skyscraper in the Western Hemisphere.